PBC: You knew Swami Bhaktivedanta (leader of the International Society of Krishna Consciousness) as well. 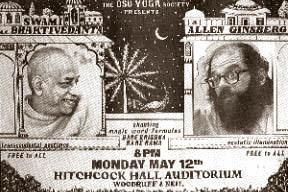 Allen Ginsberg: Since '66 I had known Swami Bhaktivedanta and was somewhat guided by him, although not formally -- spiritual friend. I practiced the Hare Krishna chant, practiced it with him, sometimes in mass auditoriums and parks in the Lower East Side of New York. PBC: You really did a lot to popularize that chant. Probably the first place I heard it was when I saw you read in '68. Allen Ginsberg: Actually, I'd been chanting it since '63, after coming back from India. I began chanting it, in Vancouver at a great poetry conference, for the first time in '63, with Duncan and Olson and everybody around, and then continued. When Bhaktivedanta arrived on the Lower East Side in '66 it was reinforcement for me, like "the reinforcements had arrived" from India.